We want Switch SW2 to be Active HSRP Router for this Topology, and The Virtual IP address that’s we gonna be servicing is 10.1.1.1, I assumed that we configured the interfaces with ip address and Protocol. Ø Initial State: -The HSRP State of an interface after it first comes up or has undergone a configuration change. 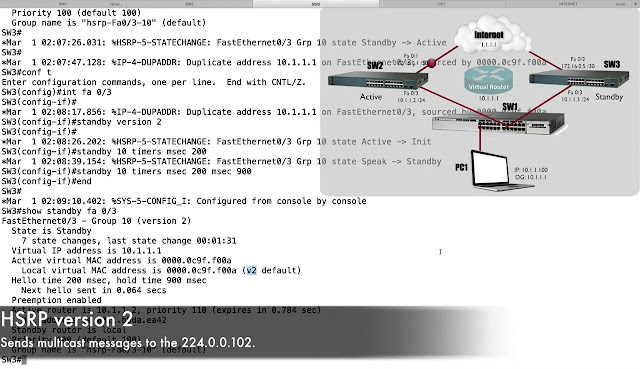 Ø Listen State: -The HSRP State of an interface after the router knows the Virtual IP address, and the interface is listening to Hello messages. Ø Speak State: -The HSRP State of an interface when it is sending Hello message and is participating in the Active/Standby Election. Ø Standby State: -The HSRP State on an interface when it is the candidate to become the next router, and its sending Hello message. 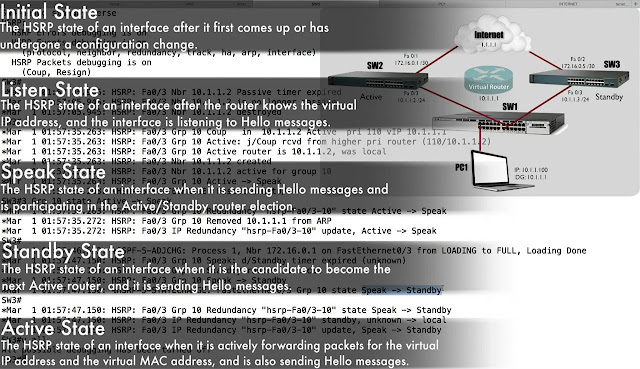 Ø Active Router: -The HSRP State on an interface when it is actively forwarding packet for the Virtual IP address and the Virtual MAC address, and it’s also sending Hello messages. Next Let’s Demonstrate a feature that we talk about earlier called “Interface Tracking”. Notice on Picture that, if Switch SW2 were to lose fastethernet 0/1.Then it would not be the best choice to get out to the internet. However, SW2 would still be able to send SW3 Hello messages. And the result it will still be the Active Router. What we can do is, tell HSRP to track the state of that interface, and that interface goes down. We want to decrement our Priority, remember we got Priority of 110, we can say “if this interface state goes down, then decrement the priority by 20”, that would takes us from 110 down to 90, which would be lower than the Priority of Switch SW3.Here how we do that. “As the Result we are now in “Standby State”. Switch SW3 is now taken over as the Active Router because that interface going out to the internet went down. It let’s do thing like, decrement the Priority in the event of a certain network conditioned. Such as “Route” disappearing from the IP Routing Table. We’re having the Metric of Route exceeding the certain value. Let’s see how setup. “If Tracking Object number 2, which is checking the Reachability of the Route (2.2.2.0/24 Network for e.g.). if that has down condition, my Priority is gonna be decrement by 20”. If we lost that “Route (2.2.2.0/24 for e.g. )’ from our IP Routing Table. Then will automatically decrement our Priority, and that’s means we are not gonna be Active Router. We will in Standby State. And The Active Will Switch SW3. 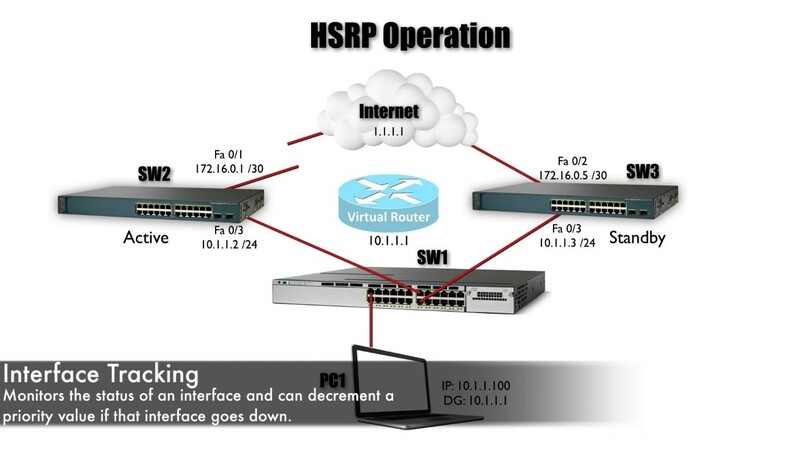 In this Point we seen the basic of HSRP, what is to prevent somebody from adding a “Rough HSRP Router” to our network, setting the Priority Really High, and then taking over the Active Role causing traffic flow through their device. But this point nothings prevent that happening. To Do We can enable Authentication for an HSRP Group. Let set it up between Switches SW2 and SW3. We probably do not be sending plain text Authentication across the network, because if somebody capture those packets, can clearly read that packet. Usually better to MD5 because that’s gonna run a “Hashing Algorithm” on the string, and each side runs the “Hashing Algorithm”, and they compare Hash Values. If the Hash values equal, then they have some assurance that the other side or device has the same string. Let’s set this up on Switch SW2. Now Wrap up this Topic using our Network Architecture. Let’s think about couple of design issue surroundings HSRP. 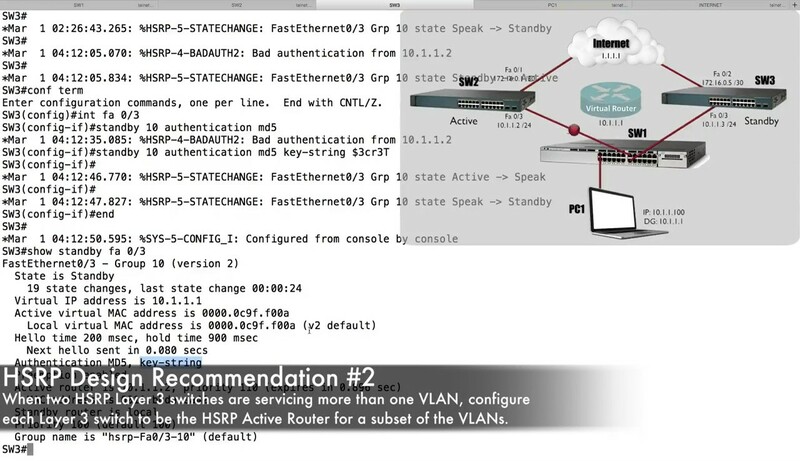 Cisco Says let’s make Layer 3 Switch, that acting as “HSRP Active Router” for a VLAN, Let’s make that the same Switch that acting as the “Spanning Tree Protocol Root Bridge” for that VLAN.Actuallly were traffic that vlan and optimal path to get to HSRP Active Router. 2. HSRP Load-Balancing: We know what “Per-Vlan Spanning Tree Protocol” is allow us to have different STP instances for the different VLANs. 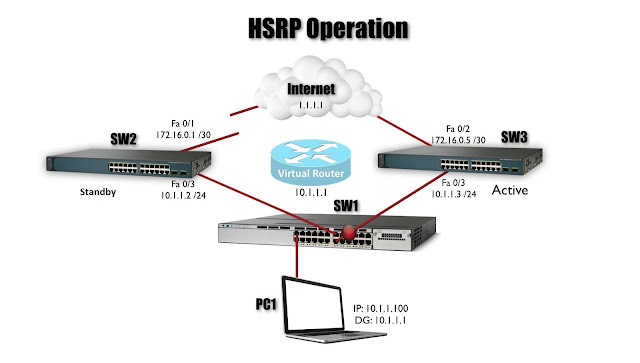 Well similarly we can have different “HSRP groups for different VLANS”. That give us some sort of Load-Balancing. 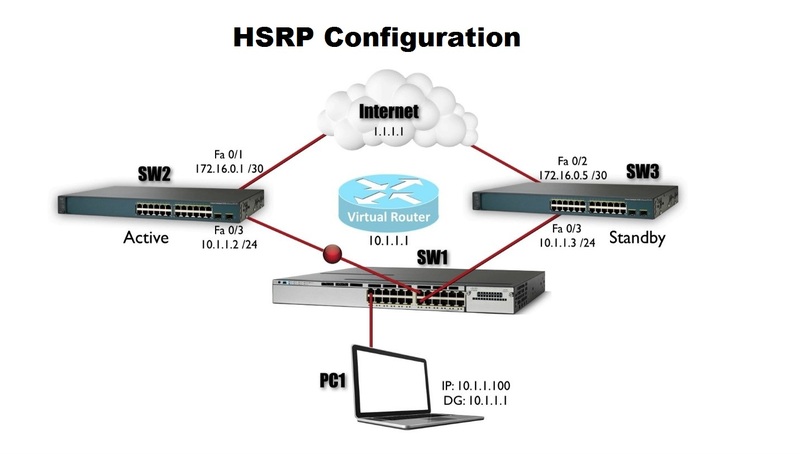 For example, we might assign interface “VLAN 100 to HSRP group 100”, and interface “Vlan 200 to HSRP group 200”. Then we can have “1 Switch the Active Router for the HSRP group 100”, and the other Switch which would be “Active Router for a HSRP Group 200”, and that can let both of these Layer 3 Switches actively be forwarding traffic, instead of having one of them just standing be waiting for the other to fail. If You Like the Post. Don’t forget to “Subscribe/Share/Comment”. Thank You.